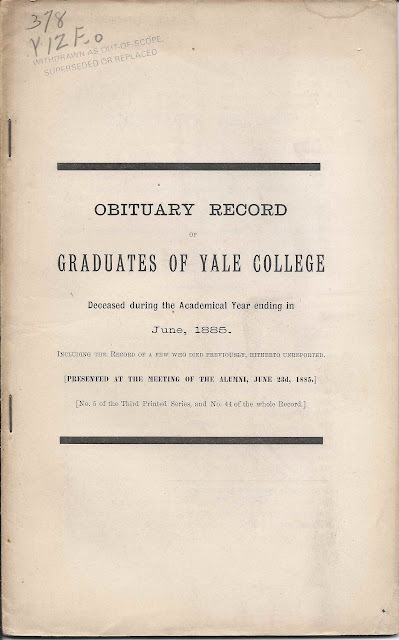 Obituary record of James Taylor Dickinson, Class of 1826, in the June 1885 issue of the Obituary Record of Graduates of Yale College. After graduation, Dickinson practiced law at Montreal and then decided to enter the ministry. After studying at Andover Theological Seminary and Yale, he became the pastor at the Second church (Congregational) at Norwich, Connecticut. After the death of his first wife, he became a missionary at Singapore, where he stayed until about 1845 when ill health forced him to return home. He married again and lived at Middlefield, Connecticut, where he spent the remainder of his life in study in his library. 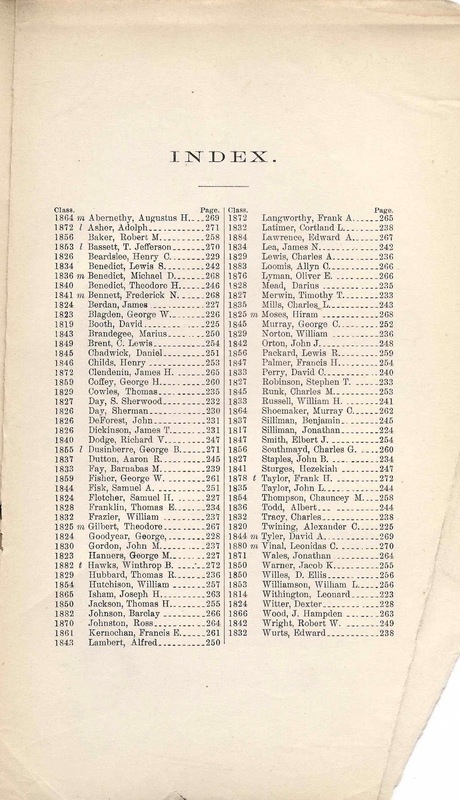 The last few pages of this booklet are a Summary of the deceased graduates and an index, all pages of which appear at the end of this post. 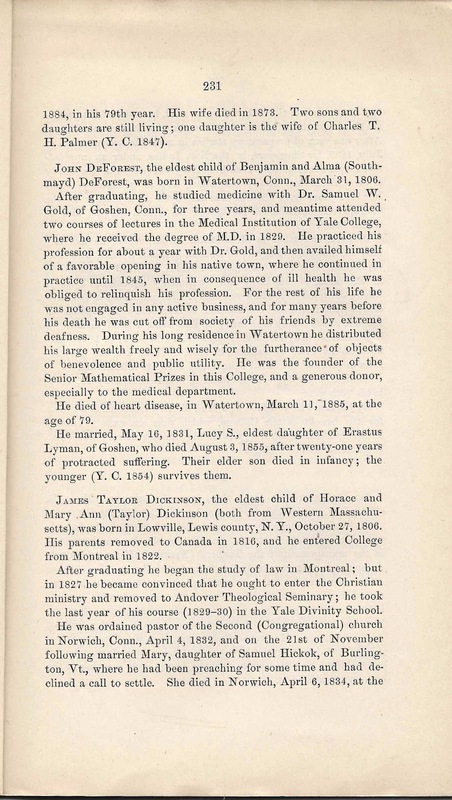 James Taylor Dickinson, the eldest child of Horace and Mary Ann (Taylor) Dickinson (both from Western Massachusetts), was born in Lowville, Lewis county, N.Y., October 27, 1806. 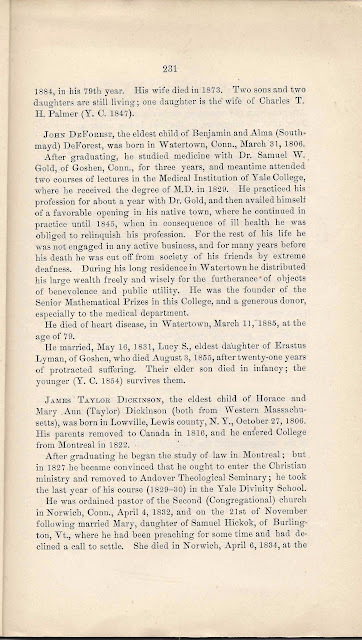 His parents removed to Canada in 1816, and he entered College from Montreal in 1822. 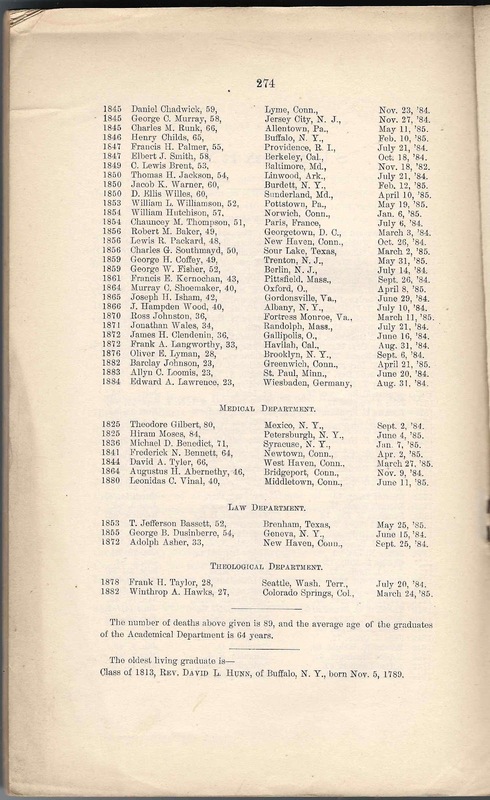 After graduating he began the study of law in Montreal; but in 1827 he became convinced that he ought to enter the Christian ministry and removed to Andover Theological Seminary; he took the last year of his course (1829-30) in the Yale Divinity School. 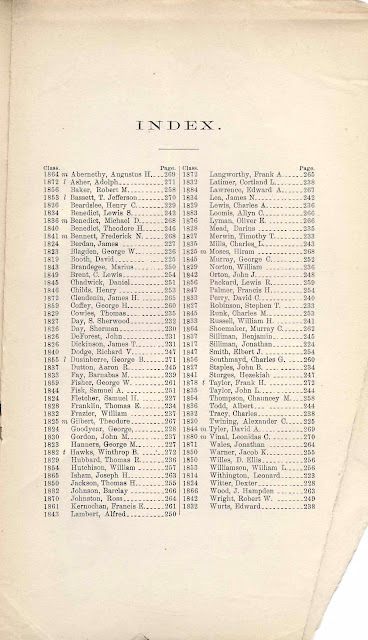 He was ordained pastor of the Second (Congregational) church in Norwich, Conn., April 4, 1832, and on the 21st of November following married Mary, daughter of Samuel Hickok, of Burlington, Vt., where he had been preaching for some time and had declined a call to settle. She died in Norwich, April 6, 1834, at the age of 19; and on the 20th of August next, he resigned his pastorate that he might fit himself for the work of a foreign missionary. 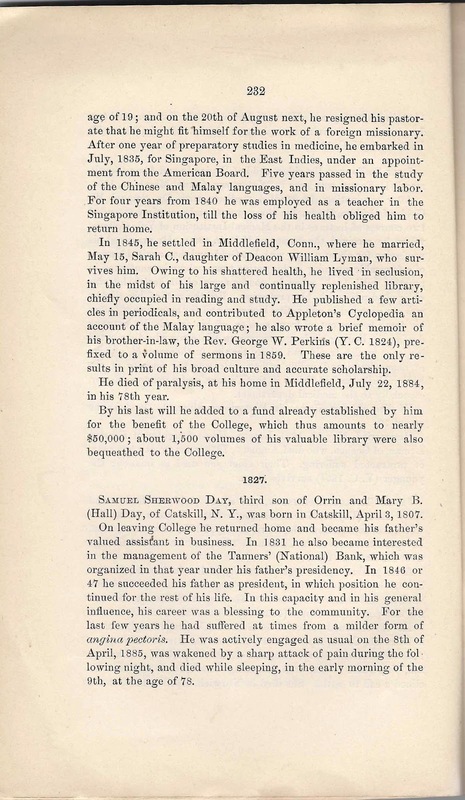 After one year of preparatory studies in medicine, he embarked in July 1835, for Singapore, in the East Indies, under an appointment from the American Board. Five years passed in the study of the Chinese and Malay languages, and in missionary labor. For four years from 1840 he was employed as a teacher in the Singapore Institution, till the loss of his health obliged him to return home. 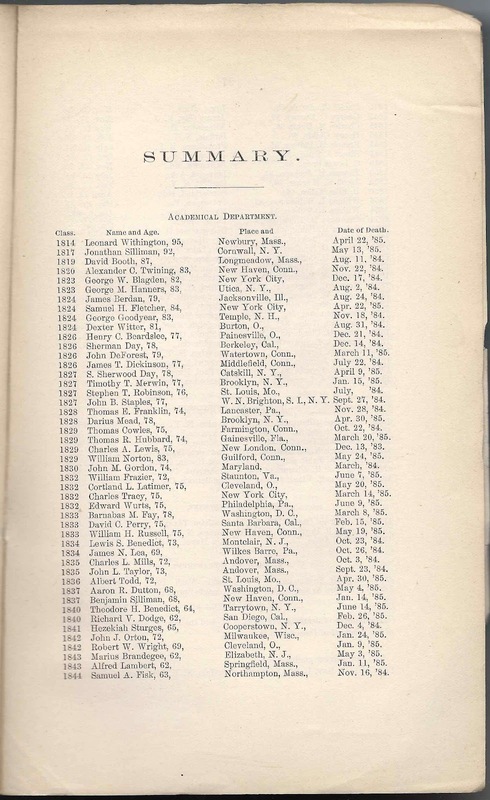 In 1845, he settled in Middlefield, Conn., where he married , May 15, Sarah C., daughter of Deacon William Lyman, who survives him. Owing to his shattered health, he lived in seclusion, in the midst of his large and continually replenished library, chiefly occupied in reading and study. He published a few articles in periodicals, and contributed to Appleton's Cyclopedia an account of the Malay language; he also wrote a brief memoir of his brother-in-law, the Rev. George W. Perkins (Y.C. 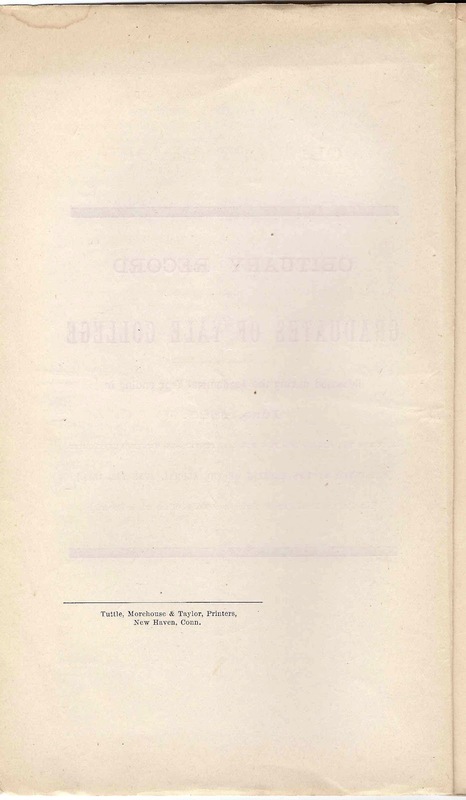 1824), prefixed to a volume of sermons in 1859. 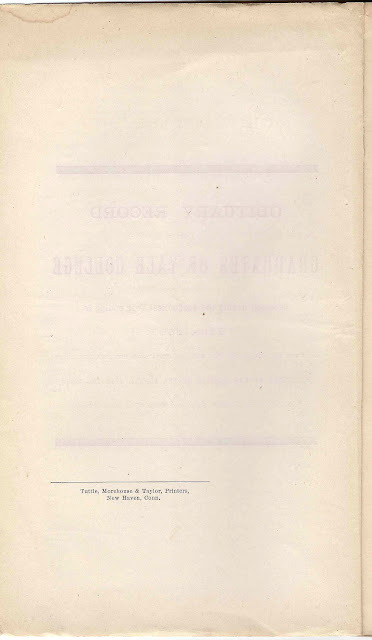 These are the only results in print of his broad culture and accurate scholarship. He died of paralysis, at his home in Middlefield, July 22, 1884, in his 78th year. 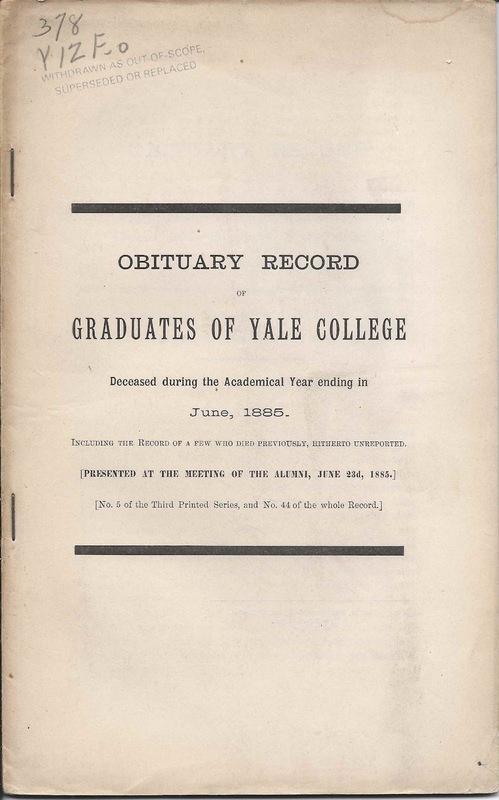 By his last will he added to a fund already established by him for the benefit of the College, which thus amounts to nearly $50,000; about 1500 volumes of his valuable library were also bequeathed to the College.